Almost all of the respondents ranked speed of response and resolution as the most important aspects of customer service, closely followed by having a friendly representative to deal with their query. However, in reality, just one in three Brits would rate the speed of response (35%) and the resolutions (36%) provided to them as “good” or “excellent”, the lowest level of all countries surveyed. Globally, 67% of consumers surveyed said they use different platforms before deciding on a purchase, with 64% expecting real-time assistance regardless of the channel in question. 78% state that a company’s reputation for customer service is important to them when choosing to buy from a particular brand. 37% say that they increasingly expect to be able to contact the same customer service representative in each channel, a reality which is arguably quite a way in the future for most brands. This may not even be best practice for companies wanting to deal with each channel efficiently, but the fact that the customer demands it sets clear standards for the way a CRM system should operate. Nearly half of respondents (47%) expect to be able to return goods or purchases through a different channel than the one they purchased from, for example buying online but returning in store. Only 7% of those surveyed are extremely satisfied with the omnichannel customer service offered to them by brands and the vast majority (87%) believes that brands need to work harder to create a seamless customer experience. 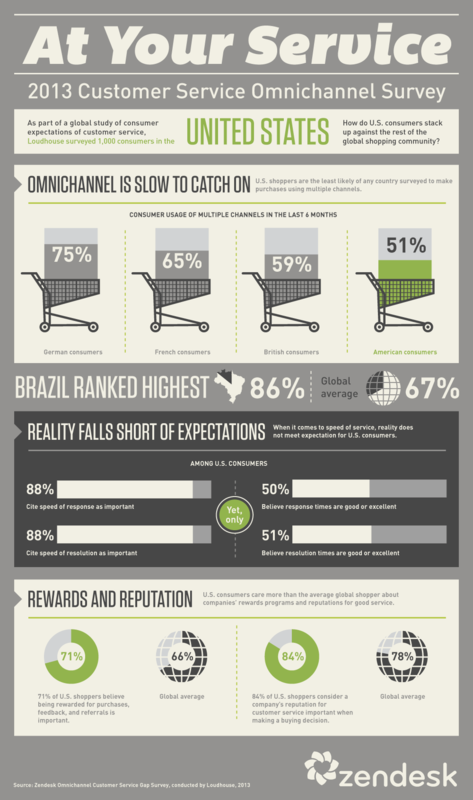 Click below to enlarge the global omnichannel customer service infographic. Email is almost level with the phone in the UK– 53% of people had emailed customer service compared to 54% calling. UK customers have low expectations of their own tolerance – 27% of UK customers, the highest number in Europe, describe themselves as less tolerant than others when dealing with customer service. UK customers don’t believe they are seen by companies as a priority – 80% of UK respondents believed companies cared more about selling through multiple channels (web, phone, social media, stores etc.) than creating an integrated user experience. This figure stands at 67% in Germany and 65% in France. One in three shoppers admits to spending more when customer service is excellent. 82% would use a company again if they’ve received excellent customer service. 62% would recommend a company to friends or family if they’ve received excellent customer service. Perseverance is strong amongst shoppers but varies by age. Nearly half (45%) say they will try any channel available and wait indefinitely to have their query received. The older the consumer, the more patient they are. Of those aged 18-24, 41% say they are more likely to be persistent, in comparison to 48% of 55 -64 year olds. 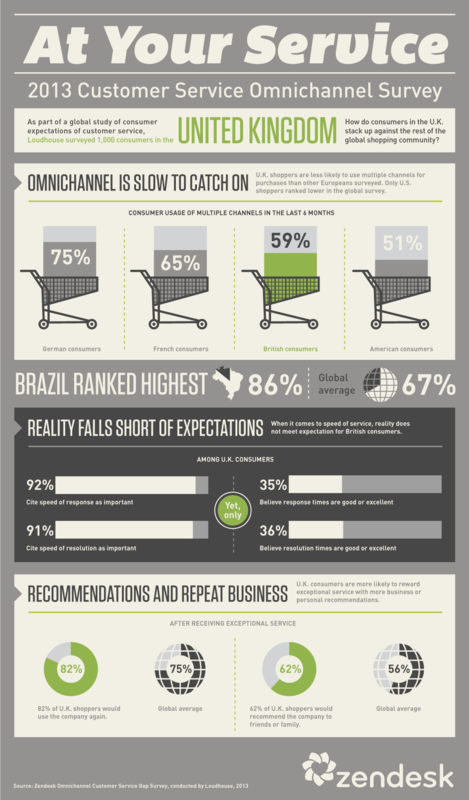 The Japanese were revealed as the most tolerant consumers, with only 8% of omnichannel shoppers falling into the ‘impatient’ category, while the Brazilians are the most ‘impatient ’with every two in five omnichannel shoppers described as such. Poor customer service across channels globally is leading consumers to use phone support as a reliable and truly two-way communication channel. 54 % of consumers in the UK and globally still use it as their first contact for support. When email is unanswered, 71% will revert to using their phone. When social media is unanswered, 55% will then phone. When the phone is unanswered, 54% will try to call again. Click below to explore the UK and US omnichannel customer service infographics.